Familiar and convenient elements of the Microsoft IntelliSense technology ("AutoComplete") now are accessible in your Clarion applications! The EasyAutoEntry (EAE) class and template will allow your end users to enter the data simply and easily! Once entered the data will be saved and automatically offered in the convenient form in the necessary moment. It's enough to simply add EasyAutoEntry (EAE) template into the application and all controls such as ENTRY, COMBO and SPIN (matching the given masks) will gain the magic "AutoComplete" property. Support of EditInPlace (only for the ABC templates). 1. Suggested Part - Style in which expected continuation of a string automatically occurs as a selected part. It is possible to scroll variants (Up/Down or Shift+Up/Shift+Down). 2. PullDown List - Style in which all variants of expected continuation of a string occur in the pulldown list, you may go to this list (UpKey or a mousy) and to select the necessary variant. In the process of input, the number of variants reduces. 3. Combined - Combined style. If there is more than one variant of expected continuation of a string - the "PullDown List" style is applied. In the process of input, the number of variants reduces. As soon as there is only one variant left - the "Suggested Part" style is applied. 4. "Windows Shell" - style which allows to use standard Windows AutoComplete for URLs and File System. To type the files, paths and URLs in your applications it is very simple now. (the version 5.0 and greater of shlwapi.dll library (Internet Explorer) is required). You may use this style freely because of AutoComplete will just not work for users without shlwapi.dll library. The DEMO version includes the DEMO-template and the DEMO-library. 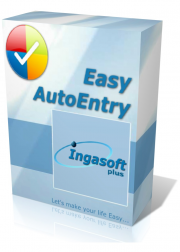 It will allow you to test all possibilities EasyAutoEntry (EAE) in any your application. In offered variants of continuation of string the word "(demo)" will be automatically added. You'll get libraries, templates, examples and complete documentation for the class and templates.